What Do You Want in an Endurance Horse? It appears we aren't ALL crazy. Over 100 of you responded to the poll: "What are the Top 3 traits you require in an endurance horse?" Despite some of the crazy horses I've seen on some endurance rides, the number one attribute required of an endurance horse is a good brain. A horse with a good brain is less likely to injure himself or you, and he's likely to last longer because a good-brained horse will listen to his rider (and hopefully the rider shares this good quality). A very close second is good conformation. That will take care of much of another aspect of your endurance horse. A horse with a good build from the ground up - good feet, straight legs, proportional and balanced neck and back will help those muscles and tendons work smoothly over time and distance. 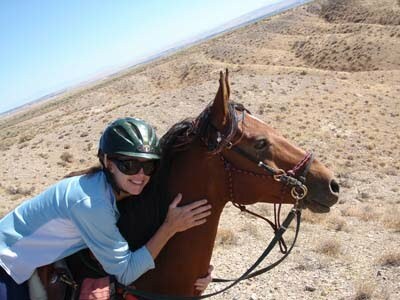 The third most popular requirement of an endurance horse is being smart - he or she knows how to take care of him/herself. We can assume that means a horse will eat and drink well out on trail and in vet checks, and he'll know to slow down and take a breather if he needs one (especially if his rider isn't aware). Some horses will go and go and go down a trail, with no sense of how fast is too fast or how much is too much till they about kill themselves. A smart horse is one who won't do that. 3. A back that fits my saddle." One reader suggested it's important for the horse to have had ample space to run around in his early years, naturally developing and strengthening the tendons, ligaments and bones as he grows up. There are always a few exceptions to the rule, and one doesn't always know how a horse has been brought up, but it's a fact that a horse who will be expected to compete in endurance over many years must have a solid foundation of conditioning. A horse that has grown up building his own foundation will have an advantage to one brought up in a stall. And that's the great thing about endurance - we don't all have to ride 16.2 hand Arabian geldings with the perfectly manicured 2 inch mane, all going down the trail in the same frame at the same speed with the same comportment. It just goes to show that our horses are as diverse as we riders are, in personality, conformation, and ability - and manes. It looked like a sad little Ridecamp, with but 3 trailers huddled together in back, and a small group parked out front, but it was really a family gathering of horse nuts come for the last Owyhee endurance ride shindig of the year, with old timers and newcomers and a bunch of juniors, three of whom are in running for year-end National Junior awards. With great thoughtful foresight, I arranged for a rainstorm down low and a snowstorm in the Owyhee mountains a few days before the ride, eliminating the heavy summer dust on the trails, and providing a scenic snowy backdrop for ambience. 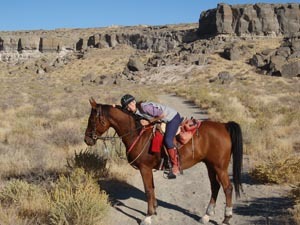 while blue storm clouds left riders alone but highlighted the rippling hills of the Owyhee desert and the rocky buttes of the Snake River. A witch and a ghost, a fire dancer and a clown, Pippi Longstocking and a bikini-clad beach girl galloped the trails, while a saucy pony sported a sunflower hat and boa feathers and a clown horn that scared him when his rider honked it! A Fargo law officer and her dog Hannabelle Licker worked the vet checks while Death roamed around. When Karen Steenhof won the 75 miler and Best Condition on day 1 on Rusty, she reached 17,000 AERC miles. When 4-foot tall Sarah rode 6-foot tall Krusty, she finished her first ever endurance ride on Day 1, and a new endurance rider was anointed. Though she was worn out, she still climbed aboard Krusty on day 2 and finished her second endurance ride ever, and an endurance addict was crowned. Two more juniors rode their first endurance rides on Day 2. Each night sounded like a packed cheering stadium with the family group of riders packed in the warm house for the evening awards and home cooked meals. It doesn't take a horde to make a mighty endurance ride, just a good group of endurance riding junkies with a love of good trails and great horses, like the kindred endurance souls at the Owyhee Hallowed Weenies.